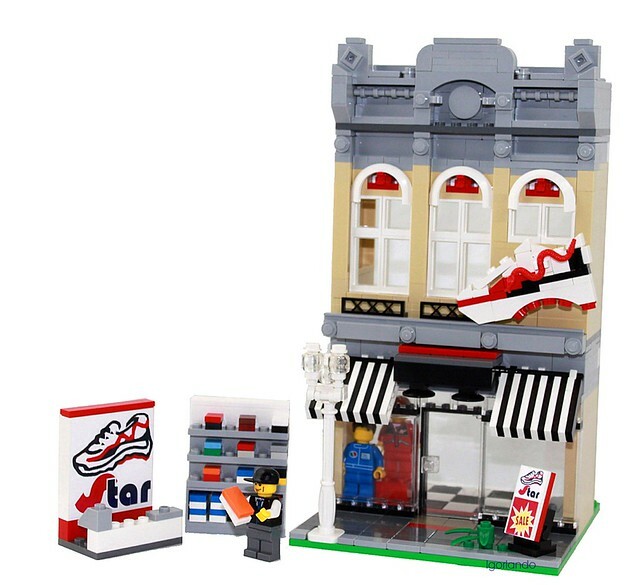 Brick Town Talk: If the Shoe Fits... - LEGO Town, Architecture, Building Tips, Inspiration Ideas, and more! 1 Towncenter Drive- (BTT) According to the shop's catalogues and weekly inserts, Spring has sprung, and what better time to trade out that grimy pair of sneakers at home for a fresh, shiny and new pair? When you've got a hankering for slightly overpriced footwear, stop at the beautiful Star Footwear and Apparel shop. From the amazingly well-executed shoe sign on the second floor, to the professional-quality stickers, L. G. Orlando crams about as much detail as anyone would care to try to add to his open-backed buildings. This one is no exception.